One of the bonuses of working the world of drinks is that many of my cow-orkers are also booze obsessives. Step-up to the plate Mr Nic Vaughan – medical prosthetics designer(?!) turned trade guy at TWE, both our tame American and American whiskey go to guy. 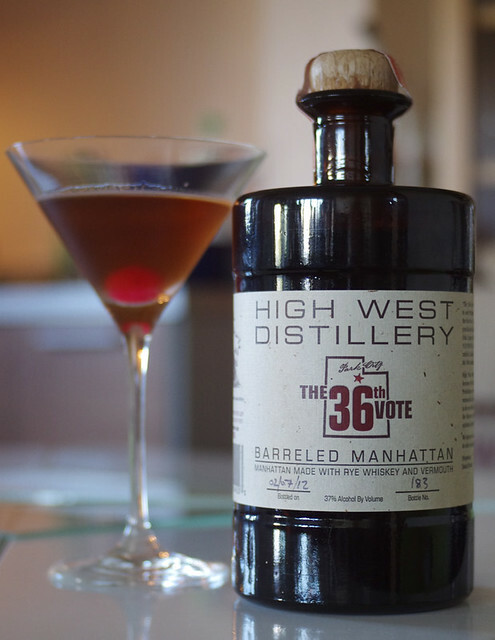 On his trips back to the US to see friends and family Nic often picks up interesting things, and earlier this year he picked me up a bottle that has been sitting on my shelf for a while, but finally got finished last weekend – High West’s 36th Vote Barreled Manhattan. High West have picked up a reputation over the last few years as being purveyors of rather good spirits. They’ve been running since 2007 from their ‘Saloon and Distillery’ in Utah, the first licensed distillery in the state since the end of Prohibition in 1933. Their whiskies are starting to get better distribution in the UK, but being a small operation (although their popular Rendezvous Rye was at least initially bought in from elsewhere while their first stocks of whisky were maturing) there’s still not a lot of their whisky to go around. Nic brought me back an example of something that he and I have been discussing for a while – a barrel aged cocktail. 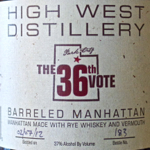 They call it The 36th Vote in honour of Utah’s role in ending prohibition. They were the 36th and final state required to ratify the 21st amendment (there were only 48 states at the time and 3/4 of them had to agree), doing so at 5:32pm EST on December 5th 1933. This was the was the amendment which repealed the prohibition establishing 18th amendment, a role that, according to the back of the bottle, they deliberately took, having waited for Pennsylvania to be the 35th so that they could take the ‘glory’. High West use a recipe of 2 parts rye (I assume it’s their own and quite young) with 1 part sweet vermouth and a couple of dashes of bitters – they call it ‘the pre-Prohibition recipe’ but it’s also the most common one I’ve seen, and is the one I use it home. They then marry the cocktail in the barrel that the rye whiskey came from for 90 days before bottling. Before dilution it’s quite complex, with a sweet and spicy nose of dried cherry, vanilla, raspberry, a hint of blackcurrant, butter, rye and lots of spiciness – cinnamon, liquorice root and coriander. To taste it has sweet liquorice, cinnamon toaste, cherries, syrup and a gooey, sticky middle, and it finishes with sweet spice, more syrup and a bit of damp cardboard – a concentrated essence of Manhattan that’s worryingly drinkable at room temperature, if a little sticky. Stirred with ice it’s much more as you’d expect from a Manhattan, with a sweet cherry nose and some maltiness, a sweet palate adding in a bitter kick from the bitters, some young spirit, a hint of new oak rubberiness and some spicy rye, finishing sweet and sticky. A decent Manhattan that’s well integrated and softened from the often easily distinguishable ingredients of a freshly made one.